The promise of India as a growing economic super power has begun to stall. Some deeper rooted issues like the decline in investment can be traced to the massive corruption eating away at the fabric of the once-galloping economy. An incident in India gave me an unexpected glimpse into what it feels like to live in a country where government officials openly ask for bribes. In July 2013, I was asked to pay an additional, unofficial 'fee' to register a will for the benefit of my son. When asked if it was usual to pay this 'fee', the man told me, with no hint of hesitation, that 'senior Government officials and even Army Generals pay the unofficial fee here'. My lawyer present there shrugged her shoulders and said this is how it works. This is just a tiny glimpse of the rampant corruption in the country. For the average Indian, it has become entirely routine. Citizen groups have now sprung up to combat something that successive governments and its 'civil service' have been unable to do. 'I Paid a Bribe' an innovative crowdsourced platform encourages citizens to report a bribe that they may have paid. It is an attempt to document everyday corruption and analyse its cost to the society. The analytics show that the 21,975 instances of reported corruption have cost Rs 57.3 crores (USD 9 million). It is worth considering what this decay in the very foundation of the country's economy is costing India. A Federation of Indian Chambers of Commerce and Industry(FICCI) and Ernst & Young study 'Bribery and Corruption: Ground Reality in India' revealed in 2013 that between October 2011 and September 2012, corruption in India, including major scams (like the Commonwealth Games scandal) added up to a financial cost of Rs. 36,400 crores (USD 5.92 billion). To put that in perspective, India's healthcare budget for the year 2012-2013 was 24,890 crores (USD 4.05 billion) or 68 percent of the amount lost to corruption. Corruption is also costing India in numerous ways that are not immediately quantifiable. India's goal to transform itself into a market for foreign companies and attract investment is increasingly being challenged by corruption and red-tape. India ranked a dismal 94 out of 176 countries in the Corruption Perception Index of Transparency International. Perhaps the greatest cost is to India's social fabric which is being irreparably harmed, leading to a deficit of the public's trust in government. 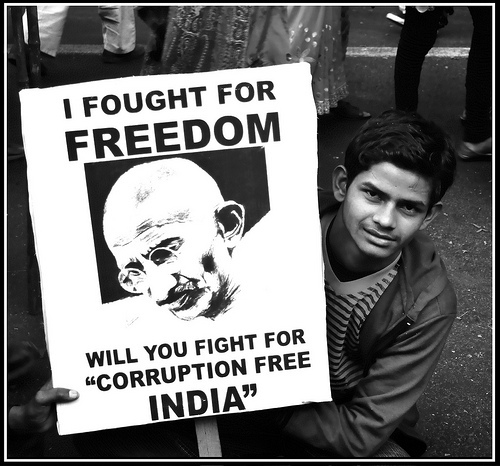 Corruption is one of the causes for structural poverty, instability and inequality in India. Transparency International's 2013 Global Corruption Barometer stated that almost all key Indian institutions were under the sway of corruption. Seventy-one percent of respondents to a survey believed that corruption had increased from 'a little' to 'a lot'. While 75 percent of people expressed that the police force is corrupt, an astonishing 86% of people believed that political parties and their leaders are corrupt. 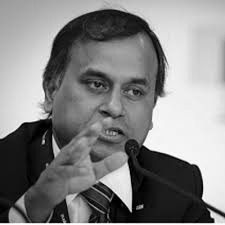 Decades after it was initially proposed, the Jan Lokpal bill (Citizen's Ombudsman Bill) a potential game changer in the anti-corruption crusade, was scuttled in Parliament, causing the newly elected Delhi State Government and the political party at its centre, to resign. Citizens have made their support of it clear by proposing to political parties that it be included in their election agendas. Although some, have made it a centrepiece of their campaign, the larger political parties have hedged their bets by being non-committal about the issue. India is one of those few countries where the Election Commission is yet to make financial disclosures mandatory for politicians and enforce penalty on defaulters. As much as 90 percent of political party finances come from 'unknown sources'. The income and assets of all elected and appointed representatives must be made public. This is nominally achieved through the filing of pre-election affidavits and the release of annual income tax returns. However, most politicians have become adept at hiding money in plain sight through the setting up of proxy accounts. Relevant clauses pertaining to the Election Commission's powers on this matter are rather insufficient; the need of the hour is to amend the Representation of the People Act of 1951 so that the penalty for perjury is more severe and can serve as more of a deterrent. Nani Palkiwala, a great legal luminary and economist from India remarked in his book, We, the People: "Truly, we Indians are a 'low arousal' people. We endure injustice and unfairness with feudalistic servility and fatalistic resignation. The poor of India endure inhuman conditions which would have led to a bloody revolution in any other country." Starting on Monday, April 7, 2014 more than 800 million voters will begin to cast their ballots at 930,000 polling stations in the first phase of an election process that will last for more than six weeks. This arrives at the end of a particularly ugly campaign cycle where politicians have traded allegations and counter-allegations of corruption. It is clear that unless corruption becomes the most important election issue for the average citizen when going to the polls, things are unlikely to change. Indeed, it is our civil society and 'we, the people' who have to stand up peacefully and resist corruption. Corruption is an epidemic tearing into India's foundation and economic wellbeing. It can only be fixed by those who live in this country -- 'we, the people'.